The Cologne Philharmonie is used for productions and concert recordings of all WDR music ensembles. 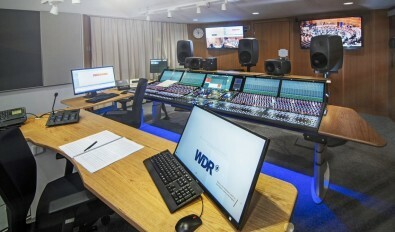 Cologne-based German public broadcaster Westdeutscher Rundfunk (WDR) has upgraded its Philharmonie Production Complex facilities to include new audio production and networking technology from Lawo. The broadcaster upgraded the entire infrastructure in its auditorium and control complex within six weeks during the 2018 summer break. Until the completion of the new control rooms, an OB truck parked outside the building, which was already using the new hall infrastructure, handled recordings and transmissions of the venue’s concerts. The Cologne Philharmonie is used for productions and concert recordings of all WDR music ensembles (WDR Symphony Orchestra, WDR Big Band, WDR Broadcast Orchestra, WDR Radio Choir), but is also for a wide range of cultural programs. The heart of the modernized audio equipment is an IP-based Lawo mc²96 audio production console installed in the recording control room. This is used for mixing and recording concerts and transferring audio signals to a new Lawo sapphire compact radio broadcast mixing console, which is installed in the on-site speaker's room for moderation and broadcast-relevant contributions. The contract was awarded by WDR at the beginning of 2018 and the entire project was completed on schedule after three months. Depending on the production, the new Lawo mc²96 desk can be operated with a sampling rate of either 96 kHz or 48 kHz. Depending on the production and quality requirements, the new Lawo mc²96 console can be operated with a sampling rate of either 96 kHz or 48 kHz. With a processing capacity of 192 (384) DSP channels at 96 (48) kHz, a router board with 8192 x 8192 crosspoints and 72 faders on the user interface, the Lawo console offers numerous options for future projects. WDR chose the mc²96 because it wanted comprehensive redundancy—the mc²96 includes a router card, DSP card and redundant power supplies—to ensure maximum operational reliability. The sapphire compact console is located in the speaker's room of the Philharmonie and can be operated either independently or in combination with the mc²96. For live broadcasts from the Philharmonie, it is used before and after the concerts as well as for interviews. For interviews, it is looped into the transmission chain during the current program and triggered via the router card of the mc²96 from the console’s surface—all without clicking. In order to avoid level jumps during the takeover, the sapphire's takeover control is set to the correct position by remote control from the mc²96. The transmission signals in 5.1 surround and stereo are then transmitted from the mc²96 via a Ravenna audio networking connection to the main control room of the WDR radio station and transmitted live. A compact Lawo sapphire console is located in the speaker's room of the Philharmonie and can be operated either independently or in combination with the mc²96 desk. During the upgrade, a new cabling concept for the microphone paths via Dallis I/O systems as stage boxes was implemented, providing a new connection to the hall technology, FoH and monitor position and transmission technology (television broadcasts and streaming). Thanks to short cable routes to the microphone preamplifiers under the stage and in the ceiling as well as the connection of the mc² HD core and the signal distribution via fiber optic, high signal quality is maintained. In addition to the symphony orchestra, the Philharmonie production complex also houses the WDR Big Band, which uses the facilities for concerts and recordings. Since the Big Band postproductions of its recordings are done in its own control room with an mc²66 console, the new Lawo mixing console in the Philharmonie contributes to the efficiency of the music production as sound engineers who work in both SCRs are now using a familiar work surface. The project was supervised by WDR’s Department for Music and Production, designed by the WDR Planning and Project Engineering Department and implemented by Cologne-based systems integration company Mediatec Video- und Audio-Service GmbH.